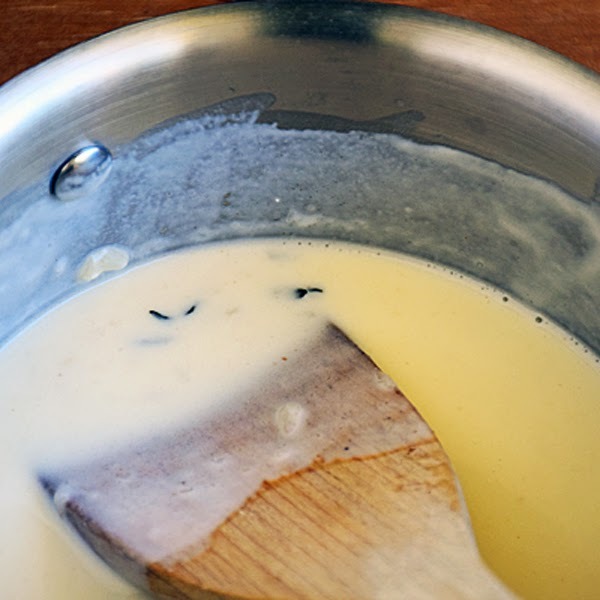 Bechamel Sauce is a basic white sauce that consists of butter, flour and milk. It is one of the 5 'mother sauces' used in cooking. It's a good idea to learn how to make this simple sauce, as it is the base for a number of other sauces and can be used in many different recipes. 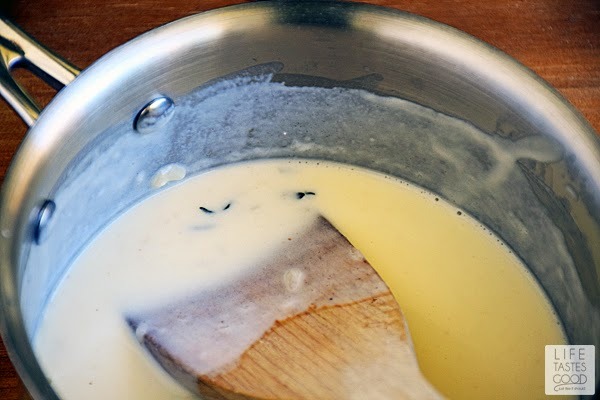 Bechamel sauce can be used in a variety of ways and you'll find many different recipes out there. 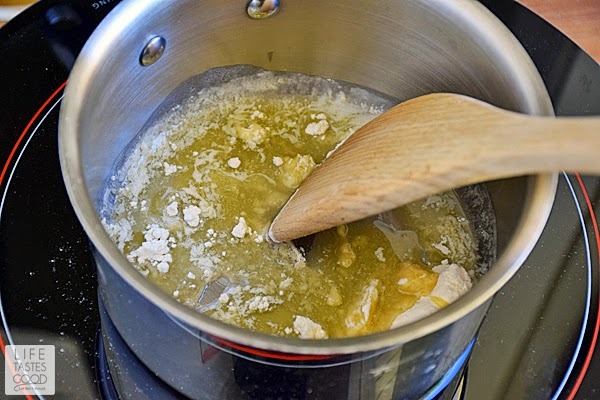 A basic Bechamel sauce is seasoned simply with salt, but I am adding garlic to this recipe, because I LOVE garlic <smile>. I also plan on using this sauce as a base for our favorite pizza - Spinach Artichoke Pizza. 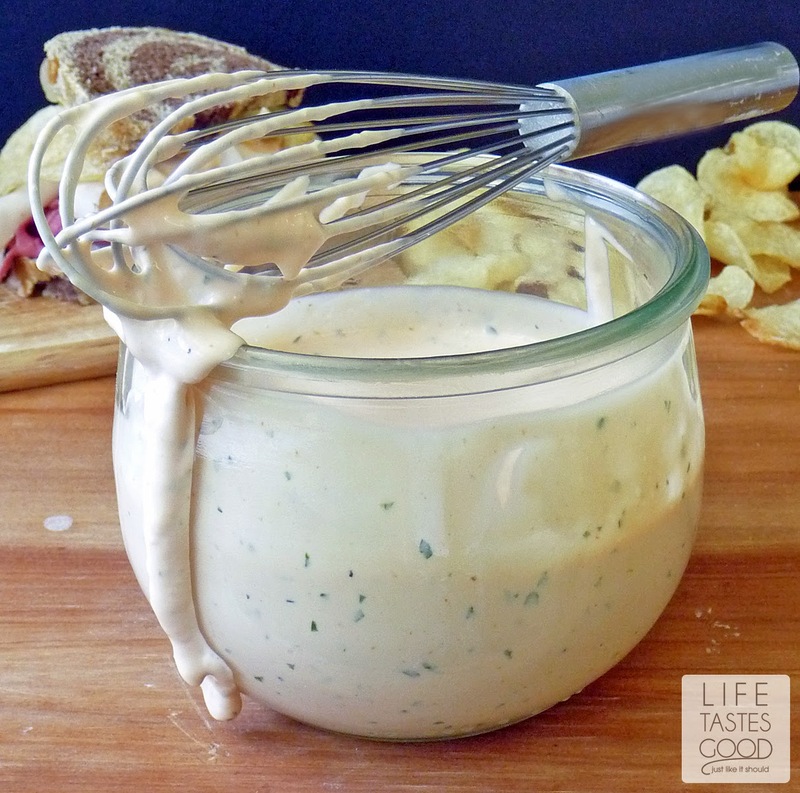 This is also the sauce I use for my easy Skillet Spinach Artichoke Dip. If you are making a recipe where you prefer not to have garlic, then skip that step. No worries! 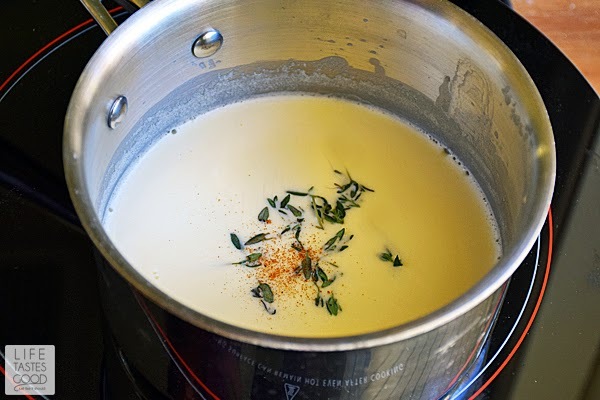 To make this simple white sauce, start out by melting 4 tablespoons of butter in a saucepan over mid-low heat. 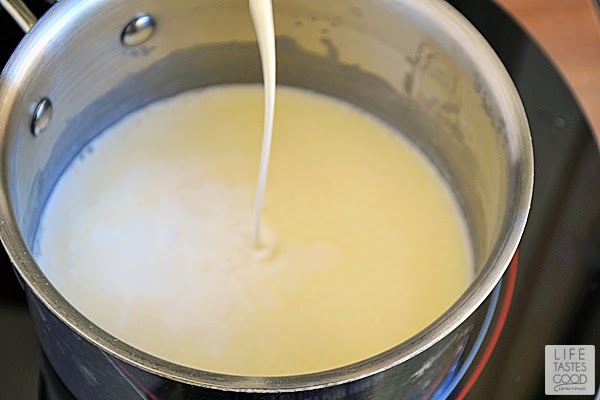 We are making a white sauce, so be careful not to brown the butter. and whisk until combined. Cook for about 5 minutes over low heat, whisking as you go. Finally we season our sauce. I like to season this with a pinch of salt and a pinch of cayenne, and I add in a teaspoon of fresh thyme leaves for a little extra somethin' somethin' <wink>. Bring the sauce to a simmer and cook for about 5-10 minutes until the sauce thickens. That's it! Easy peasy! Give it a taste and adjust the seasonings to your liking. Now you are ready to use this sauce in a variety of ways. My favorite way is to add my favorite cheese and toss it over macaroni, but I'll be using 1/2 of this sauce combined with a 1/2 cup shredded Gruyere cheese as a base for my Spinach Artichoke Pizza. 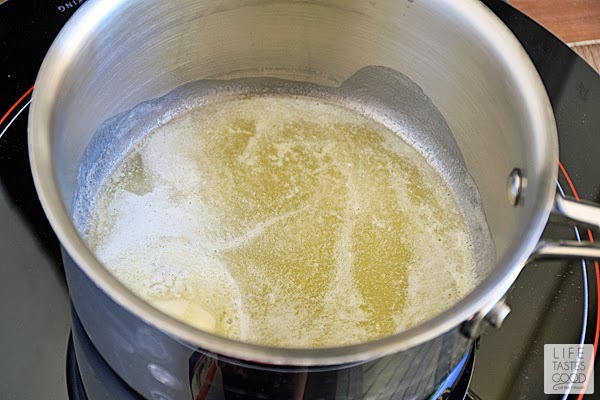 Melt 4 tablespoons of butter in a saucepan over mid-low heat. Be careful not to brown the butter or the sauce won't be white! Add in 1/2 tablespoon of freshly minced garlic and cook for 30 seconds to a minute until the garlic smells wonderful! Be careful not to burn it!! Then stir in 1/4 cup all-purpose flour and whisk until combined - cooking for about 5 minutes. 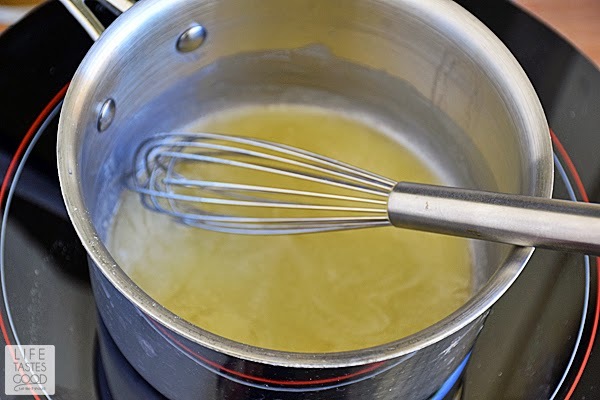 Slowly whisk in 2 cups milk. I whisk this in about 1/2 cup at a time, cooking and stirring about 1 minute in between each addition. Add a pinch of salt, pinch of cayenne pepper, and 1 teaspoon fresh thyme leaves and bring to a simmer over low heat until the sauce thickens. Thickening of the sauce will take about 5-10 minutes. Give it a taste and adjust the seasonings to your liking. Enjoy! Great tutorial, Marion! You make me want to make some Lasagna now. I bet that sauce would make any dish delicious! Made this tonight and added Fontina cheese, DELICIOUS! Thanks for the recipe! I found a recipe for a beefy eggplant casserole that called for this sauce. I had never heard of it, but really it is a traditional sauce, from the sounds of your ingredients and instructions. Here in the deep south we just call it white gravy or milk gravy, it is also good with crumbled up friend pork sausage over biscuits.